You have your plans and reports in hand and are ready to start your indoor waterpark resort. Where does the money come from? In terms of occupancy levels and average daily rates, many indoor waterpark resorts are doing far better than hotels without indoor waterparks in equivalent markets. Despite this competitive advantage, financing your new indoor waterpark resort will be more difficult than financing a typical hotel or commercial building. Indoor waterpark resort projects are usually larger in scale and require larger development loans. Additionally, the risks involved in starting and operating an amusement-oriented resort property are higher than those involved in starting and running other types of properties. Also, if you are planning to start an independent property rather than a franchised property, you will have the additional challenge of overcoming the typical lender’s view that independent properties are less economically stable than franchised properties. 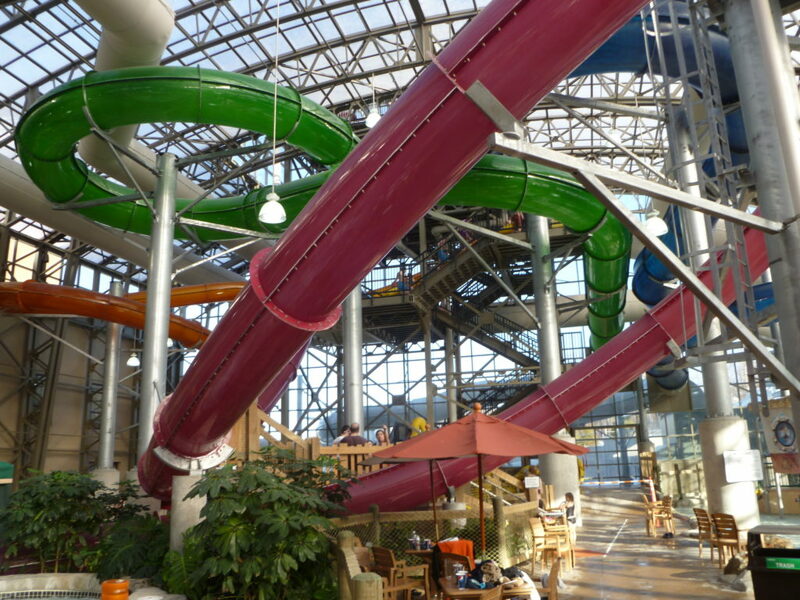 This article characterizes indoor waterpark resorts and the types of financing that are generally available. A discussion of the challenges to obtaining financing is followed by suggestions to overcome those obstacles. 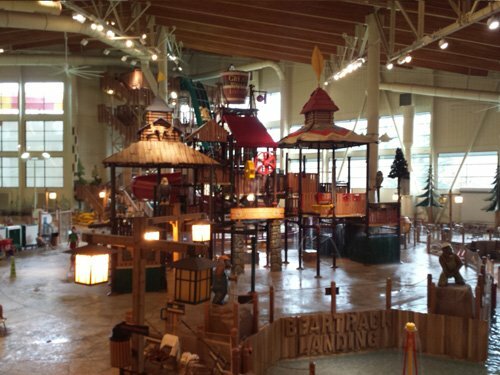 Hotel & Leisure Advisors (H&LA) defines an indoor waterpark resort as a hotel facility connected to an indoor waterpark with a minimum of 10,000 square feet of indoor waterpark space with amenities such as slides, tubes, and play structures. Many hotels with large swimming pools claim to have an indoor waterpark; however, these do not fit our definition of an indoor waterpark resort and should technically be referred to as hotels with water features. Many of the early indoor waterpark resorts were independent properties. In recent years, franchised waterparks have become more common, but independent properties still dominate the market. Franchised properties typically are smaller hotels which also target corporate demand. Independent properties tend to be larger facilities which are focused on leisure demand. 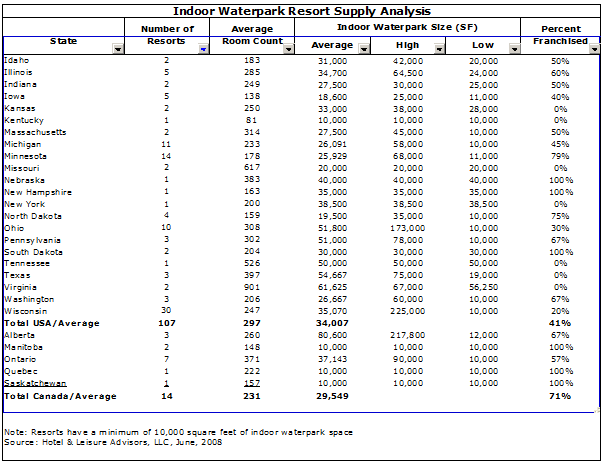 The following table summarizes the current supply of indoor waterpark resorts in North America. The chart also indicates average room counts, waterpark size and the percentage of properties which are franchised. The growth of indoor waterpark resorts has been strong in recent years with 30 projects projected to open by year-end 2008. Many new indoor waterpark projects have been proposed at new resorts and existing hotels throughout the northern United States and Canada. As of June 2008, we are tracking 313 properties in the United States and Canada which are proposing to add indoor waterpark facilities or are developing new construction indoor waterpark resorts. The list has grown over the past year from 273 properties as of July 2007 to 313 properties in June 2008, indicating substantial interest in indoor waterpark development in North America. However, most of the proposed projects are still trying to obtain financing, and the refinancing market for indoor waterpark resorts and hotels in general has become more difficult in 2008 as compared to recent years. To obtain financing for an indoor waterpark resort, developers need to have strong management expertise and character to demonstrate to the lender that they have the experience necessary for developing and operating the property. The developer needs to have sufficient collateral and capital so the lender has confidence that the loan will be repaid. Most importantly, the property’s projected cash flow must be sufficient to easily cover the projected debt payments. Cash flow projections must be clearly defined and have reasonable bases. Lenders will scrutinize financial projections provided by a developer to determine their reasonableness and the resort’s potential for success. The lender will utilize the appraisal as well as an analysis of construction costs in determining the prospective loan for the project. David J. Sangree, MAI, CPA, ISHC interviewed various lenders and investors concerning the financing of indoor waterpark resorts in June 2008. The following chart summarizes the rates and types of financing commonly used with indoor waterpark resorts. The rates quoted for the 2008 survey indicate that lenders have become somewhat more cautious as compared to 2007 concerning their loan to value ratio and debt coverage ratio as they are expecting the developer to provide a higher amount of equity for the project. They are bigger: Indoor waterpark resort projects are generally larger in scale and require larger development loans. They cost more to build: The development costs for an indoor waterpark resort are typically much higher than for many hotel properties. Some properties can cost between $150,000 and $400,000 per available room when indoor waterpark costs are included. The indoor waterpark itself may cost from $200 to $600 per square foot of net indoor waterpark space. They are hotels: Hotel income, which relies on daily variations in occupancy, is less stable and predictable than income for properties secured by long-term leases; therefore, they may be viewed by lenders as a high-risk situation. They are amusement facilities: The addition of an indoor waterpark to a hotel creates more of an entertainment destination, and, in spite of the success of many existing indoor waterpark resorts, some bankers perceive amusement facilities to be more risky than other types of commercial property. There are not many of them: The number of indoor waterpark resorts which exist in the United States is quite small – less than 125 with indoor waterparks over 10,000 square feet. Therefore, lenders are generally unfamiliar with the dynamics of these properties. A developer may need to spend extra time educating a lender when trying to acquire a loan. Developers find it easier to obtain financing for franchised properties than for independent properties because lenders tend to view franchised properties as more economically stable. A developer may counter these difficulties in obtaining financing by preparing a comprehensive package of documentation for a lender. A thorough feasibility study will provide projections of revenues and expenses by outlining industry trends and successes. The study also educates lenders about this relatively new area of real estate development. A strong business plan illustrates the developer’s expertise and commitment to success. A well-documented appraisal will analyze construction costs and the market feasibility of the resort in determining the market value. Together, these documents provide the lender with solid information on which to base prudent financing decisions. Typically, lenders require a higher equity contribution for an indoor waterpark resort loan than for a more traditional hotel loan. Our interviews with hotel lenders indicated that the climate is changing; lenders are beginning to look at indoor waterpark properties with more interest than they had in previous years. In spite of this growing interest, there still are relatively few lending institutions actively soliciting these types of projects. However, as more properties are developed and begin to show strong performance, we anticipate that financing will become somewhat easier. A case in point is the Great Wolf Resorts. Their performance has increased Wall Street’s knowledge of this specialized area of the hospitality industry. Conclusion: The financing environment for indoor waterpark resorts is currently difficult due to lack of lender interest and larger equity contribution requirements. However, these difficulties can be overcome with a well-documented market feasibility study and an appraisal report, which fully explain the market dynamics and income potential for the resort project and serve to educate the lender. Article was originally published in the World Waterpark Association’s 2008 Development and Expansion Guide.